A simple knowledge of Ayurveda can help us to prevent and even treat painful skin disorders.According to Ayurveda, the skin has six layers extending to the deeper levels of the body. A skin disease is, mostly, rooted deeply into various tissues like fat, muscles, blood etc. Most skin treatments are generally treated externally by applying creams or oils. Ayurveda always tries to root out the disease deeply by treating the disease according to its cause. As the disease is deep seated, it is difficult to cure easily. 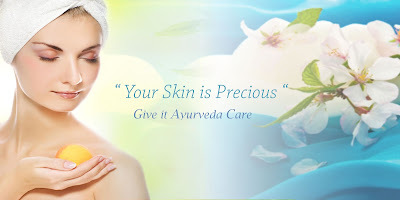 Ayurvedic skin treatments may take a few weeks to remove the symptoms but the diseases are treated permanently. Vitiligo:Vitiligo refers to the white patches in the body and scalp.It is caused mainly due to the absence of melanin. In ayurveda diseases are treated rather than treating the disease. Here blood is purified and cleaned and retain the original body colour. Psoriasis: is a non contagious skin disease that attribute dry, red and scaly patches. Panchakarma treatment in ayurveda is prefered for purifying the blood. This treatment does not have any side effects. Eczema: It is a skin disease that is caused on the upper layer of the skin. Physical exercises, Blood purifying, and the application of Herbal ointments are the various treatment involved in ayurveda. Scabies : It is a contagious disease that caused by small mites. Ayurvedic treatment has proved to be effective in the treatment of Scabies. Following a diet or lifestyle that is against nature imbalance body energy and thus destroys the body tissues which results in a skin disease. In Ayurvedic terms, although skin diseases are caused due to heat or fire. Therefore all those foods should be avoided. Removing the root cause is the way of treatment in Ayurveda. Therefore all the foods and activities that caused due to heat and fire should be eliminated. Some general remedies for all kinds of skin diseases. One should avoid tea, coffee, alcohol, hot spices, fried foods, acidic and sour foods. White sugar, white flour products and preserved or tinned foods should also be avoided. The most irritating skin problems can be cured through these simple remedies and tips. Thousands of patients suffering from skin disorders have received relief through Ayurvedic remedies. Amrita Ayurveda medical centre run by Dr. R.S Roy offers various Skin Disease Treatment in Ayurveda. Treatments other than described such as Urticaria,Dandruff, Scabies,Dermatitis, Acne, Dry skin are also available in this hospital. All these diseases are treated without any side effects and gives the best results. There are many different vitiligo natural treatment are used in market for get rid of vitiligo naturally. Natural Herbs Clinic,s herbal remedy is made with pure herbal ingredients and is very effective for the solution of vitiligo without any side effects.